UNITED NATIONS, October 27, updated -- Before the UN Budget committee met Thursday for the launch of Secretary General Ban Ki-moon budget proposal, a dispute broke out about how and when the European Union would speak. In the scrum in the front of Conference Room 1 with committee chairman Tomo Monthe of Cameron were, among others, US Ambassador Joe Torsella, Egyptian Ambassador Maged Abdelaziz and new EU representative Thomas Mayr-Harting, previously the Permanent Representative of Austria. After some shouting, the huddle broke up. Inner City Press learned from numerous sources that the EU's push to speak second after Argentina for the Group of 77 and China triggered much opposition, resolved finally by "a coin flip." The fight will continue, it was vowed. Under the one-time solution, the EU was scheduled at the end of the regional groups. 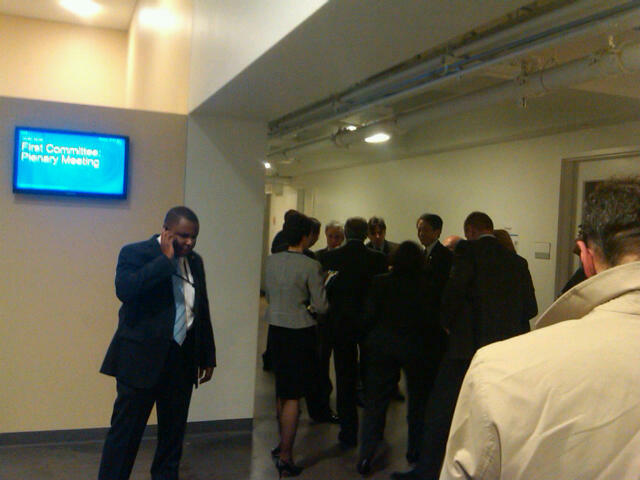 This was apparently not good enough: when Ban Ki-moon "surprisingly" got up and left even as the Caribbean group CARICOM spoke, Mayr-Harting and his entourage followed Ban out into the hall and huddled with him. A European representative complained bitterly about G77's "pure provocation." A diplomat well versed in the budget expressed shock that Ban left, along with his senior adviser Kim Won-soo and Vijay Nambiar. "It won't help Ban," the diplomat predicted. And there are many fights to come. Ban was criticized for, among many things, delays in his ERP project call UMOJA -- Ban's top management official Angela Kane has defended the project and its exposed former director -- and for refusing to appoint a Special Adviser on Africa. Only after the EU finally spoke would the US take the floor, in the form of Ambassador Joe Torsella. He had proposed televising the session; G77 responded that all General Assembly committees should be UNTV. Inner City Press tweeted at Torsella for a reply; he tweeted back that the US seconds the motion to televise all budget committee functions. But what about the other committees? Watch this site. Update: When the EU's turn came, Mayr Harting started procedurally, saying that Ban Ki-moon supports the EU position. Hence the hallway confab? US Ambassador Joe Torsella called for a freeze in pay at the UN, and an end to Secretariat "add ons" and recosting. He said the UN budget is misleading and unclear. Can it be cleaned up? We'll be covering it.